William Sidis and The Nature of Education. I let the 115th birthday of William Sidis pass by without comment earlier this month, but he's been on my mind since. I encountered his story in my first year of law school; a child prodigy (at 11, the youngest person to enroll at Harvard, ever), he became famous for his precocity. My sense (and Wikipedia agrees) is that Sidis was very much a product of his parents. Sidis apparently could read the New York Times at 18 months, and by age 9 knew eight different languages. At age 11, Sidis delivered a lecture on higher mathematics at the Harvard Mathematical Club, and at 17 enrolled in Harvard Law School. Despite the amazing success of Sidis as a youth, I don't think any parent would wish Sidis' future on their child. By 21, he was in jail for rioting. 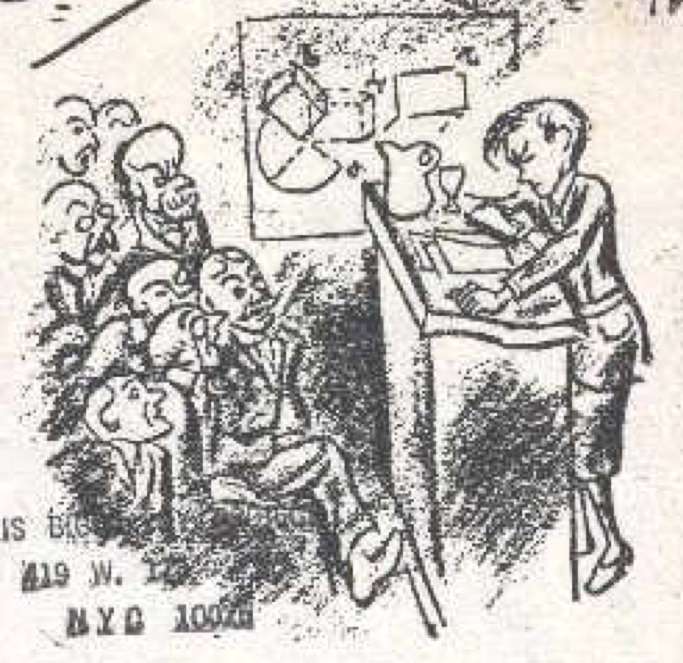 When the New Yorker ran an article and a cartoon some years later discussing how he had become an eccentric recluse, Sidis sued for invasion of privacy, took it to the Supreme Court, and lost. It's not hard to see why Sidis was so incensed by the article -- few would enjoy the New Yorker describing their life as lonely, living in a hall bedroom in Boston's shabby "South End." Sidis died shortly thereafter at age 45, of a cerebral hemmorage. Sidis has long been a cautionary guide post about how not to bring up children, and his parents were criticized extensively. 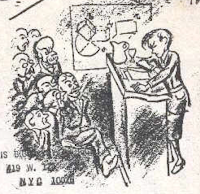 Sidis himself was portrayed derisively in newspapers even as a child. You can see the presumption in the New Yorker cartoon I've included above, from the article that provided the basis for Sidis' suit. The comic portrays Sidis as a snotty kid, a punk, know-it-all prick. "But he's a bit defensive ... I need someone who can get through to him." "Well, because you have the same kind of background." "Well, you're from the same neighborhood." "Boy genius from Southie ... how many shrinks you go to before me?" Which makes me pause when I consider William Sidis now. Few viewers of Good Will Hunting today would consider it implausible that the brilliant mathematician would be so out of touch that it would take him five tries to think of getting someone to talk to Will from the same neighborhood, from the same tradition, from the same culture. We find it believable that the mighty, the wealthy, the brilliant, and the powerful are unable to communicate with the poor. Yet at the same time, we sense that Robin Williams' character immediately understands things about Matt Damon's that Stellan Skarsgård's will never comprehend. It is Robin Williams' ability to speak to he who Stellan Skarsgård cannot that is the work of genius depicted in the film. It is Robin Williams' ability to communicate between the prodigy and the professor. I take that lesson and look at William Sidis. And I am forced to ponder the nature of education. Sonoma Charter Isn't Giving The Trustees A Choice. Gary DeSmet and Helen Marsh shouldered a heavy load on Tuesday at the Sonoma Valley Unified School District Board of Trustees meeting. It was well described by Bill Hoban in this article. I know that the School Board Trustees, in their individual capacities, want to provide every bit of support they can for the families and students at Sonoma Charter. But the Charter School has a racial segregation problem that is obvious, serious, and that has not been addressed after multiple warnings. The plain fact is that there is simply no way that Sonoma Charter is a neighborhood school with this demographic profile. At all. Further, the failure to correct the problem makes Sonoma Charter look more like a relic of the past than a guide to the future of education, an issue that has come up on this blog before. It is a real failing of the Charter School administration, that they have made it so extraordinarily difficult for any Trustee, at this point, to vote to renew the charter. I am afraid for the Charter School that they have reached the point where there are now going to be consequences, and that this is going to cause real hardship for many families and students. But I think the Board of Trustees, even though I am sure they want to support the School, have simply been put in an untenable position, and that they cannot provide more public money that will be used to allow this situation to continue. From Wired: "[ATF] is looking to buy a 'massive online data repository system' ... to process automated searches of individuals, and 'find connection points between two or more individuals' ... instead of requiring an analyst to manually search around for your personal information, the database should 'obtain exact matches from partial source data searches' such as social security numbers (or even just a fragment of one), vehicle serial codes, age range, 'phonetic name spelling,' or a general area where your address is located. Input that data, and out comes your identity, while the computer automatically establishes connections you have with others." 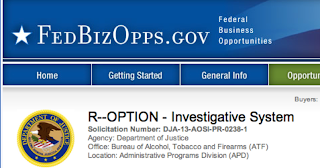 "... the ATF is widely perceived as a weak, stagnant and underfunded agency. Even if it has a database that can track you down and find out who your friends are, it won’t necessarily be able to apply that to tracing gun transactions due to Congressional restrictions. If the agency finds a gun linked to a crime, and then traces the gun to someone who bought it from someone else, all of that work figuring out the who’s-who will still likely have to be done manually." It takes a few months for the Federal Government to get moving after something like Newtown. They're making progress. However, as the article notes, Federal Law bars the ATF from creating a centralized database tracing gun transactions. It doesn't bar anyone else from doing it, just ATF. Which is a policy with certain downsides. ... and California's Deficit Comes Right Back. From the New York Times: "A federal judge on Friday rejected California’s motion to regain control of mental health care in its prisons, ruling that the quality of care failed to meet standards required by the Constitution." This suggests a significant defeat is in the offing for the Brown administration, because the State budget will now likely be thrown back into a deficit position due to the $1.9 billion in costs associated with housing prisoners out-of-state; while the decision today concerned the mental health system, it is expected exactly the same rationale will apply to the overcrowding decision. 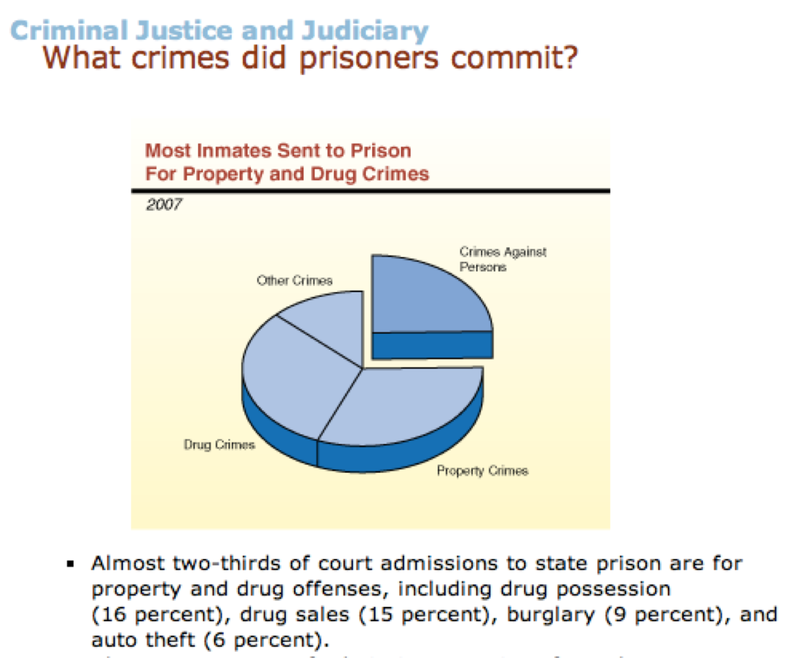 "What Crimes did Prisoners Commit?" This is not the first time I've blogged about this. Prison overcrowding is the enduring wild card in the State budget on the spending side, especially now with the emergence of Obamacare. Perhaps one of the ironies of the whole situation is that California (particularly its voters) is working rather hard to decriminalize marijuana. According to the State's Legislative Analyst's Office, approximately 31 percent of inmates in California’s prisons were incarcerated for a drug-related crime. 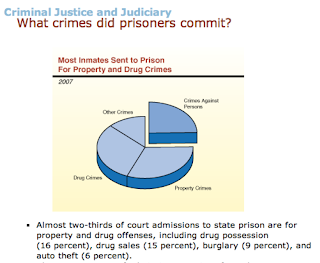 I don't think decriminalization of possession would make the difference-- there are about 1,500 prisoners at the State level for possession -- but I suspect the real change would be caused by the legitimization of formerly criminal enterprises -- there would be less need for violent "self help." But Federal law continues to block that legalization, while at the same time the Federal Government is criticizing the State for failing to build enough prisons to reduce the overcrowding that is at least partially created by the very policy the voters of the State have rejected.